Should you cut back drinking, or quit altogether? It’s not always an easy answer. Some people have a hard time with the idea that they should quit drinking, once and for all. To them, alcohol has always been a part of their lives, and it just doesn’t register in their minds that a drastic change is necessary for their lives to improve. The biggest belief you may need to change is that you are “powerless before alcohol”, or that it’s a disease you were born with. 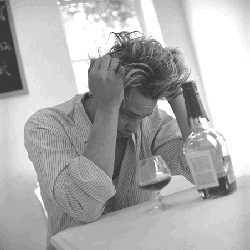 The truth is that alcoholism is NOT a disease, NOT a weakness, and NOT something you are powerless before. It is, in fact, a bad habit that you’ve acquired over the years. And, just like other bad habits we all have, it is also BREAKABLE. Once you realize that alcoholism is a bad habit, you can cut back drinking just like you might cut back on other bad habits, such as smoking or eating sweets. That’s right, go into your cabinet or refrigerator and THROW AWAY your supply. As soon as you do this you take a big step towards cutting back drinking. By throwing away your booze you are telling yourself that alcohol means very little to you. If you don’t have any supply to throw away then make sure you no longer purchase alcohol to keep at your home or office. The easiest way to cut back drinking is to remove the temptation to partake.